Monk | MONK – Renovator of the Year! MONK – Renovator of the Year! For the second time in three years, Monk Renovations has been awarded Renovator of the Year at the Canadian Home Builders’ Association – Nova Scotia (CHBA-NS) Peter Kohler Peak Awards. 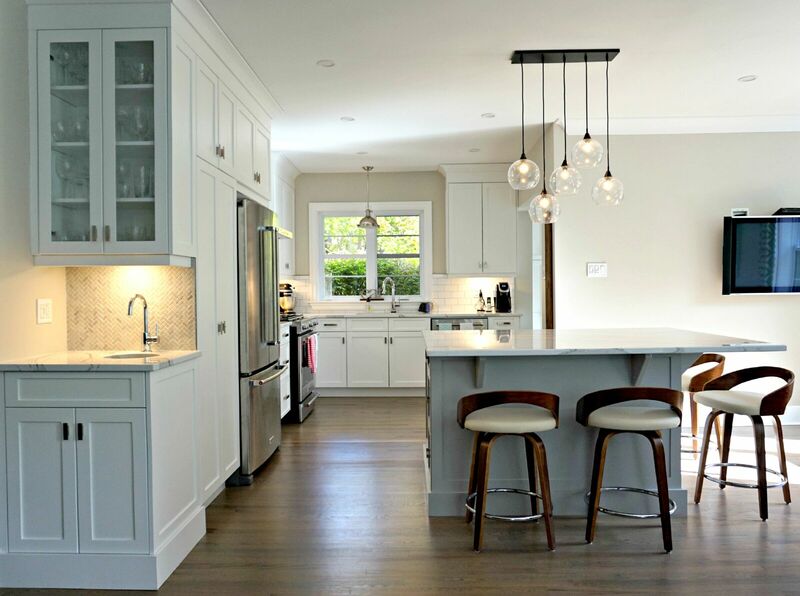 This is no small feat as Monk Renovations has proven their utmost commitment to the community, professional contribution to the renovation industry, and operational standards in daily work. Monk has been working to continually raise the bar for the growing residential renovation industry. They have a professional and skilled crew that allows Monk to execute a wide variety of projects from installing a window to doubling the size of your house. Monk’s commitment is demonstrated by their accreditations and association membership. They are RenoMark certified, Safety Certified, Certified Aging in Place (CARP) professionals, have an A+ rating with the Better Business Bureau (BBB), and are members of the Halifax Chamber of Commerce. Additionally, Dan sits as Second Vice President of the Board of Directors for CHBA-NS and is the Chair of Renovators Council as well as a board member for the Nova Scotia Construction Safety Association. Monk Renovations has been experiencing continual growth over the past number of years which can be attributed to building a tremendous reputation. This has been accomplished by doing the simple things like showing up on time, keeping clients informed, respecting the homes they work in, and doing projects for the price they agreed upon. These are all simple little things but they mean the world to clients who are not accustomed to contractors who do all the little things and do them well. In an industry where word-of-mouth marketing and referrals are imperative, Monk has an ever growing network of amazing clients, suppliers, and subcontractors who spread the word of Monk’s honesty, professionalism, and concise communication. It says a lot when a client is so proud of a contractor’s workmanship and customer service that they are eager to recommend a particular renovator to their family and friends. Dan, is a country boy, raised on the Eastern Shore of Nova Scotia and started in the construction industry at fifteen years old. He graduated from Duncan MacMillan High School as valedictorian and went on to pursue his engineering diploma at St. Francis Xavier University and received his Civil Engineering degree from the Technical University of Nova Scotia (now Dalhousie University) in 1993. After fifteen years of working as a professional engineer for other companies in technical sales and engineering project management, Dan took the leap of faith into entrepreneurship. Dan has a very unique skill set as he is the only renovation company owner in Nova Scotia who is a professional engineer, not to mention, a Red Seal Carpenter. His background and training are always present in his organization, accuracy, communication, and professionalism which sets a new standard for all contractors across Nova Scotia. Now after ten years in business and thousands of renovations completed, many of which can be viewed in the galleries on www.monkreno.com, Monk Renovations’ heart and soul remains focused on residential renovations allowing them to rise to the top of their industry. Monk Renovations has built credibility in the renovation industry and Dan is called upon repeatedly for media interviews and can be heard regularly as an expert guest on CBC Radio Maritime Noon. Dan is generous in sharing his wealth of knowledge on kitchen, bathroom, basement, exterior, deck, addition, and any other renovation or building related questions. Dan could not do it all on his own, much of the success and recognition is as a result of the team he has built which includes skilled tradespeople, estimator, project coordinator, and his connections to reliable suppliers and subcontractors. Each carpenter on the team is a multi-talented and accomplished individual who can complete virtually every aspect of a renovation. None of this would have been possible without the encouragement and support of Dan’s wife of twenty-four years, Angela. She has supported him in every way possible which has allowed him to grow a dynamic and successful renovation company, employing ten people and manage countless suppliers and sub-trades. In 2015, the Canadian Government accepted over 25,000 Syrian refugees, of which approximately 2,500 immigrated to Nova Scotia. After this influx of immigrants, Monk Renovations was fortunate to be contacted by a former client about Immigration Services Association Nova Scotia (ISANS), an organization that provides guidance to immigrants regarding the transition into their new lifestyle. Through this connection, Monk Renovations had the privilege to welcome Ahmad to the team; he is a hardworking and dedicated painter and drywaller who was eager for an opportunity to kickstart his new life and career in Canada. ISANS has a virtually seamless process which provides contractors with subsidized wage funding and an interpreter during the initial stages, plus, they offer language and safety training, and safety equipment to incoming tradespeople. As a result of this great experience, the entire crew at Monk Renovations recommends other contractors to take advantage of ISANS as it is a great source of skilled tradespeople. In just a year and a half, Ahmad has come a long way and he continues to learn and develop his renovation skills everyday. Additionally, Ahmad got married this summer and is putting down roots in his new country. Over three years ago, Rob joined the Monk Renovations team as an estimator/project manager. He graduated from a two year carpentry course at Nova Scotia Community College (NSCC) and spent several years working as a carpenter before NSCC Architectural Drafting peaked his interest. He enrolled in the two year diploma program and learned estimation, communication, and design skills. On top of exposure to building products and practices, NSCC presented career opportunities for students which ultimately led Rob to Monk Renovations. Dan hired him directly after graduating from NSCC and they have been working together to grow and become a productive, well oiled machine ever since. Monk Renovations welcomed Janet to the team as a project coordinator in March 2018. She has been a significant addition to the talent pool at Monk as she is a certified safety professional with bookkeeping and project management experience. She leverages her thoughtfulness, community orientation, and dedication in her role as she is always thinking of the well-being of clients and crew and makes decisions for the company as if it were her own. She has eagerly jumped into her new role and demonstrated her passion for community involvement by joining the Women’s Council at CHBA-NS and supporting the Supportive Housing for Young Women (SHYM) program with YWCA Halifax. Over the past decade, Nova Scotia has been experiencing a decrease in the availability of skilled trades people due to significantly increased retirement rates as the “baby boom” generation ages, but this is only a taste of what is to come. Statistic indicate that Nova Scotia will need 100,000+ skilled trades people over the next five years to replace those who are exiting the workforce. Preventative maintenance needs to be ramped up which could be achieved by reintroducing shop classes in the school system and encouraging more young people to pursue skilled trades programs at NSCC, especially carpentry, electrical, plumbing, and masonry. New tradespeople must commit to developing their skills and continually refining them throughout their career. Nova Scotia Apprenticeship Agency would be a great place to start as it will allow trades people to further their abilities. Their programs allow apprentices to gain practical experience while being supervised and working alongside Journeypersons or Red Seals in their chosen trade. Additionally, they have the opportunity to attain their Red Seal Certification by continuing their education at NSCC between work periods. As this is an issue widely spread across Canada, we need all hands on deck from the government and school boards to the construction associations and contractors. Dan and the crew at Monk Renovations are looking forward to continued growth and improvement in the renovation industry and will continue to raise the bar for all professional renovators.